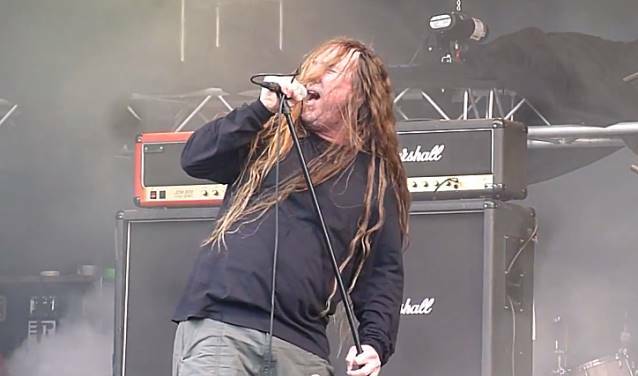 Fan-filmed video footage of Florida death metal veterans OBITUARY performing a brand new song, "Inked In Blood", on June 13 at the Copenhell festival in Copenhagen, Denmark can be seen below. OBITUARY has partnered with Relapse Records for the release of the band's highly anticipated ninth studio album. The band's first full-length CD in over five years was recorded by the band this past April at its own RedNeck Studio in Gibsonton, Florida and is currently being mixed. Commented OBITUARY on the new material: "We don't know how to explain it but we really hit the 'metal nail' on the head with this album. "We have been writing and working on the new material for nearly three years now and we could not be more excited how these songs have all turned out. "All the stars seem to have aligned for us and this release, with the songs, production and overall feel of this record, the band is more solid than ever." The album recording was funded by an extremely successful Kickstarter campaign in late 2013. Now the band has partnered with Relapse worldwide to maximize the release and impact of what is surely their heaviest and most cohesive record in 20 years. The group elaborated on the decision to create the Kickstarter campaign and sign with Relapse. "We always knew that our fans were some of the most devoted fans on the planet and they proved it by stepping up, being a part of something new and supporting us with our Kickstarter campaign," says the band. "This was an amazing display of true fan support and we could not be more proud of everyone who helped raise the money to record this album by pre-ordering it, buying all the cool stuff we offered and just being a part of something that we believe will be the way of the future. Now we have teamed up with Relapse Records to have them get this new album out there, in stores and available to the fans worldwide. "We are very excited about our partnership with Relapse and are looking forward to working beside them with the release. They are a great label and super-cool people who have shown us that they are excited to have OBITUARY on their roster and are ready to push this album to its fullest potential."